Thinking logically, it was hard to see in advance how he could have been denied today. But in this game logic only goes so far. Possibly in no other sport can so much go wrong as in F1, and so definitively. Indeed the man himself admitted that he'd spent the night before preoccupied with such possibilities. No doubt most of his fans did too. But for all that we remember the sport's dramatic last-race shifts, the probability remains that the guy who needs a mere nudge over the line manages it. And so it was today. 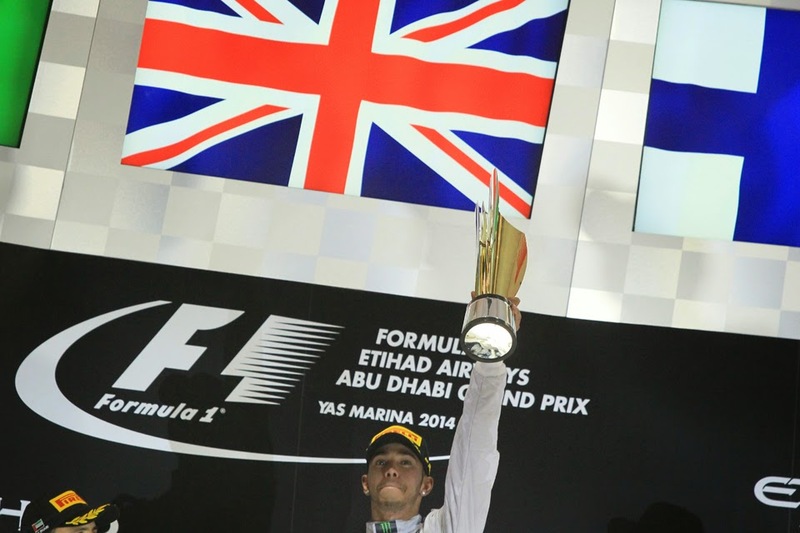 Lewis Hamilton won the Abu Dhabi Grand Prix, and with it the 2014 World Drivers' Championship. His second. It would have taken the unusual to deny Lewis, and while there were such unusual goings-on come the race they in fact fell in his favour. The very get-go was our first hint that today was going to be Lewis's day. The start of his title rival Nico Rosberg with too much wheel spin was far from ideal, but Lewis's was a peach. Launching like a rocket into a clear lead and Nico already having to cling to the end of his vapour trails. 'It was the best start I can remember having, it felt incredible' noted Lewis later. It stayed that way for a while, with Lewis not for the first time this season looking like he had things well in hand out front. That was until slightly ahead of time - with just 23 of the 55 laps gone - the 2014 drivers' title reached its endgame. In how it did so meant it came with a tinge of regret. As something indeed did go wrong. Mercedes reliability, never perfect this year, struck, and it struck Nico. The portent was him wandering off the road and losing around a second to Lewis ahead. But next time around he lost around three, and it was soon reported to be down to an ERS failure. 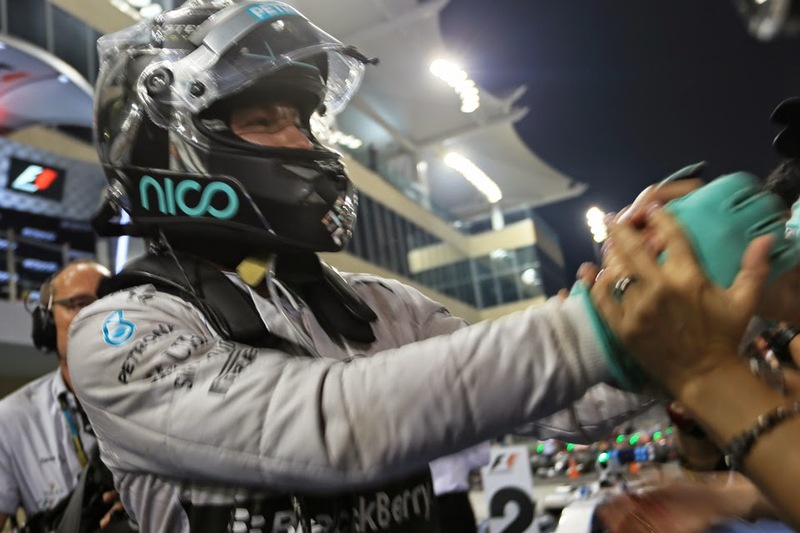 Nico pressed on resolutely, but it was clear in fairly short order that for Nico in 2014 at least the dream was over. In F1 nothing succeeds like failure; Nico reckoned more than his ERS was amiss and soon the problem spread to his throttle, while at one point the engine switched off. He sank down the order like a stone, rapidly to lower than the P5 he needed as a bare minimum if something were to strike Lewis, and eventually to a lapped P14. His team suggested he stopped before the end but Nico refused, fighting to the last. The title destination therefore wasn't in doubt by this point, though the race was a little. Almost unnoticed the amazing Felipe Massa, who alone had kept the Mercs just about sight, was trying something different. That being a long middle stint with a sprint on the supersofts at the end. He emerged from his final halt 11 seconds behind Lewis with 12 laps remaining. And he ripped strips off Lewis's lead, the latter for once not appearing to have much of an answer. In the end the Brazilian fell just short, by 2.5 seconds, partly due to a battery problem. 'We almost - almost! - sorry he was maybe a little bit too much in front, it was difficult to catch him in ten laps. But very close' said a smiling Felipe afterwards. But still Williams had two drivers on the podium for the first time since 2005, contributing to a richly-deserved third in the constructors' championship table. Much has changed in the last 12 months; for the Grove team possibly more than anyone. And in a season wherein he ran Lewis much closer on pure pace than just about anyone had anticipated, and repeatedly it seemed delivered a counter-punch at each point we began to venture that he'd been beaten, Nico Rosberg too can be proud of his campaign. Nico was gracious in defeat also: 'in the end my race didn't make a difference as Lewis won the race fair and square anyways...he deserved to win today and he deserved also to win the championship.' Few would disagree on that. 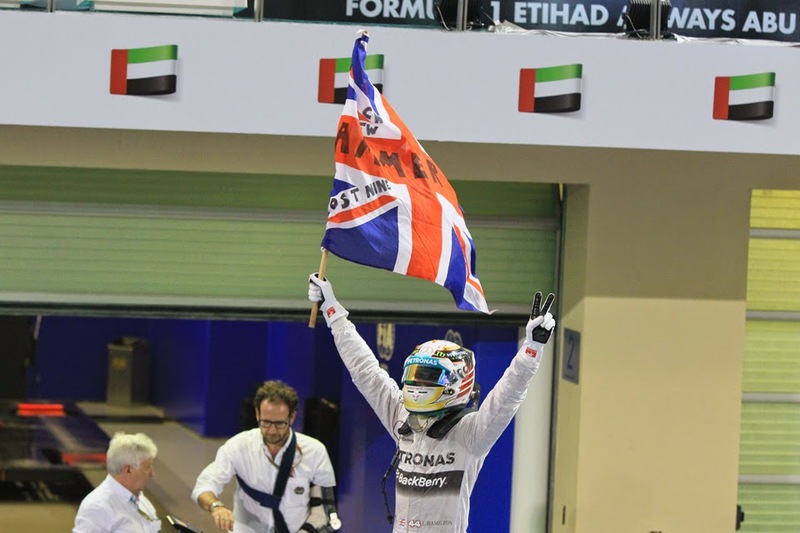 Taking Lewis's year as a whole it wasn't always plain sailing as we know. But eleven wins from 19 for him is hard to argue against, and come the races at least he was the sport's habitual pace-setter as well as, of the two Merc pilots, and perhaps overall, clearly the most decisive and effective racer. And a worthy world champion. More broadly too Lewis proved something this year. As was outlined so eloquently by Will Buxton in the build-up to the title decider Lewis's greatest strength also in a strange way does him a disservice. In that because he is so instinctively quick and competitive plenty assume that's all that he offers. Indeed rewind to the season previews for 2014 and it was assumed widely that the new formula and its myriad complexities would hold him back, and be to his team mate's advantage. Well, no. Lewis despite some insistent contrary claims that we hear is in possession of a brain, and a fine one. And when it comes to getting your head around the new cars, managing fuel or managing the tyres there was no conspicuous advantage to Nico this campaign on any of them. Indeed on at least one, maybe more than one, Lewis seemed to be the one ahead. He managed many races in a way that the last British multiple world champion, the cerebral Jackie Stewart, would have been proud. Including this one today. And what of next year for our latest champion? Well there are reasons to think 2014 was not the end. His feet will be yet further under the Merc table, while the car's handling presumably will be more tailored - especially in the brakes which still do not seem entirely to his taste. You'd imagine he'll rediscover his Q3 demon too. 'I'm going to try to come back stronger next year, there are improvements to be made' Lewis indeed confirmed afterwards. Surely even now he is firm favourite for the 2015 title as well. As is Mercedes. Of course the team continues to dig its heels in on matters such as engine development and the like (and we can understand why) but whatever development is allowed you suspect Merc will take full advantage of it too. Just as they did this season, wherein despite starting in Melbourne miles ahead seemed if anything even further ahead as the campaign ended. And the team doesn't look too likely to get complacent with its success. 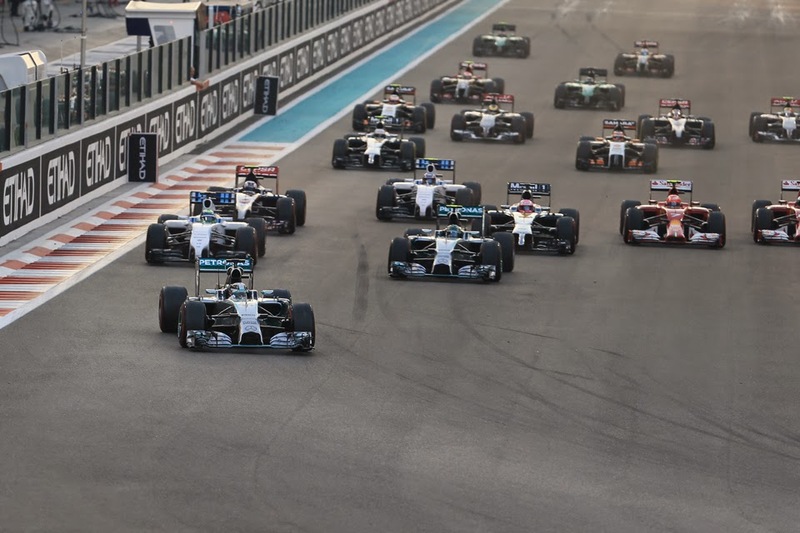 'We are in 2015 mode already' said Toto Wolff later. Ominous. The F1 year just passed more generally was far from perfect of course; in many ways we witnessed the sport at its very worst. Its blinkered and sometimes poisonous ways have harmed too many people, and may yet harm more. Possibly not since the end of 1982 have we ended a campaign with such trepidation about what awaits, of what form the sport we love will be in come next spring. One can only hope for a rapid outbreak of sense, or else for the FIA to emerge from its coma, to make things reasonable again. We also had the trauma of Jules Bianchi's accident in Suzuka. 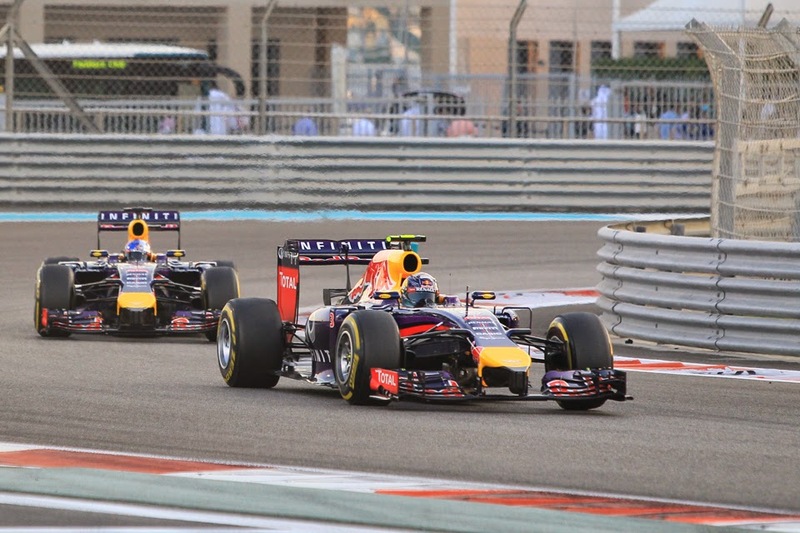 But other than that the on-track part was one element of the 2014 F1 season that didn't let us down. And it also found two deserving world champions in Mercedes and in Lewis Hamilton. Whatever else you may think of Lewis he is box office. And in his capacity of champion he'll likely do the sport a tremendous lot of good. It could do with it. And in one more development that we can all be glad of, the wretched double points didn't in the end tilt the world championship. Or anything else of much importance. May we never see its like again. There were today a few more familiar themes further back. From starting from the pit lane Daniel Ricciardo was once again awe-inspiring, ghosting up to P4 at the end without anyone being quite sure how. He is another for whom much has changed in the last year. Jenson Button also found a strong finish in P5, in what again looked an awful lot like a finish of the more definitive sort. Once again his stable mate Kevin Magnussen finished out of the points in a car that was capable of them. Indeed the only Merc-powered car that he beat was the severely-hobbled Rosberg. He has more reason than most to hope that McLaren's driver line up for 2015 is already finalised. While for Ferrari there was no inspired send-off for Fernando Alonso, the red cars being brick slow from half-distance onwards, and the two with Alonso ahead squeaking into the bottom of the points. Nando mused afterwards that it all seemed terribly samey. But not everything in F1 stays the same. Indeed we only need to go back two years to when most of us were convinced that Lewis had committed career suicide to realise that. Then jumping ship from the usually-competitive McLaren to the then perennial-inspirer-of-mirth in Mercedes. Well it turns out the move has been the making of him. It's likely significant that Lewis noted this felt like the first title, rather than the second. You indeed suspect that this is just the start.